The 2 bedroom apartment has a south facing 40 foot terrace that has commanding views over the swimming pool and the property. Both apartments are located within easy walking distance to all amenities, just 2 minutes walk away from one of the blue flag beaches, yachting marina and a host of bars, restaurants and shops. Right across the road is the top class golf course designed by Gary Player consisting of a 18 hole master course and a easier 9 hole classic course. Two luxury apartments conveniently located right in the heart of a beautiful marina & directly opposite the 27 hole golf course. The apartments are part of the Porto Fino residence which has been designed, built and furnished to a high standard giving a comfortable, light and modern feel. This fabulous development offers a communial swimming pool & large areas for sunbathing. This is the perfect location for a relaxing family holiday or the golfer who wants to be close to the course. The family resort of Almerimar is one of Spain's best kept secrets. We are a hard working family who decided to take the plunge and buy in Southern Spain for personal use and long term escape. The resort is welcoming to all and caters for all types of holidays. 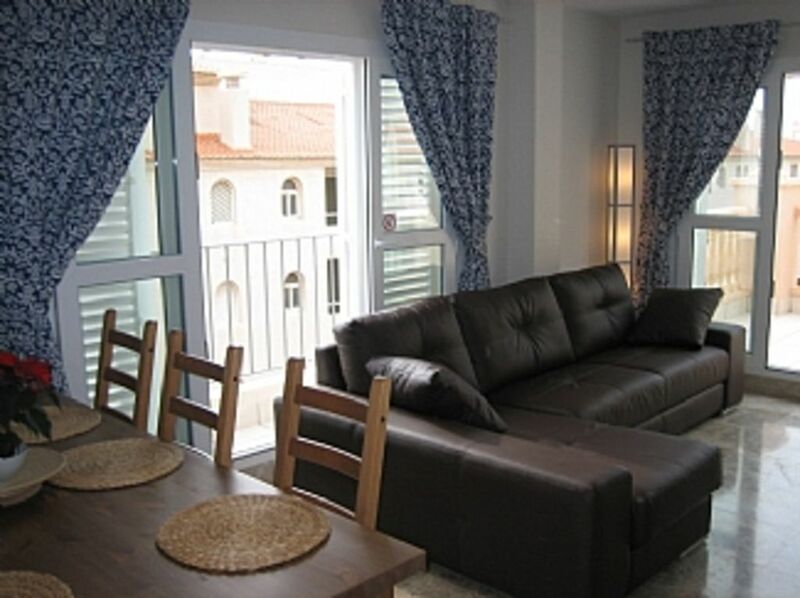 The apartment is superbly located for all amenities, you have within a 5 minute walk the beach, shops, marina, supermarket, restaurants, bars, golf. There are other apartments around Almerimar that require a lengthy walk in the hot sunshine to get to the centre, not here this apartment is central to all activities. The apartment is just 2 hours away from the great “Sky Station” ski village resort near Granada in the Sierra Nevada range, reached through breath-taking scenery on top class mountain motorways. The ski resort has ski runs going up to 3,300 meters altitude and a very attractive ski village with ample high quality accommodation at reasonable prices if you fancy staying over for a couple of nights. In the winter and the spring, one day skiing excursions are quite practical and excellent fun. Just across the road, literally a 2 minute walk with your golf clubs is the mature championship golf course surrounded by beautiful landscapes gardens with several holes featuring water. The most challenging being two island green holes on the 14th and 18th, giving a tee shot over 100 meters of water. It offers plenty of challenges for the more experienced golfer and will test your golfing skills to the full. Notes on accommodation: 2 Bed Apartment - The master bedroom enjoys patio door access out to the south facing terrace, there is plenty of mirrored wardrobe and drawer space for your belongings. The bedroom is equipped with air conditioning unit that can easily be switched from cold air to heat depending upon the time of year you stay. The second bedroom has 2 single beds, again plenty of wardrobe and drawer space as well as the air conditioning unit that functions the same as the master bedroom one. Bathroom is equipped with a sink, toilet, bidet, corner bath and shower. Kitchen has microwave, oven, extractor hob, iron, fridge freezer, toaster as well as plenty of pots, pans, crockery, cutlery and utensils. In the lounge there is access to the south facing terrace, there is a large dining room table that easily seats 6, a L shaped leather sofa that doubles as a large double bed if needed. Sky TV is provided as well as local Spanish channels, also there is a DVD player and PlayStation 1 for your enjoyment. Outside: On the south facing 40 foot long terrace is a outside table and 6 chairs, ideal for those afternoon snacks or alfresco dining in the warm Spanish sunshine. The chairs can be easily reclined to enjoy the weather, as well as 2 sun loungers being provided for th guest enjoyment. Also there is a utility area that houses the washing machine and outside sink if required. Let me say at the out set the apartment is a lovely place with all the amenities you could want, the beds were comfortable and the washing machine a very useful addition. Now the problem my husband and friend had was we asked mrs pat wood who looked after the place to see if she could see if any mobility scooters were available she got one for us but charged us 20 euros to do it taking the cost of the scooter up to 115 euros, lovely.When we were shown around the apartment she was in a rush so told us how to put the tv on but after she had gone the sky didn't work, she sent Steve out who lived close he said the sky wasn't very good in Spain. Unfortunately the next day the electrics tripped as mrs wood hadn't mentioned too many things on would do this we had no idea, we re did the electric box everything was working except the tv so steve came out and said the box wasn't any good and changed it with a new box .The next day while cooking in the kitchen the smoke alarm came on so on putting the extractor on the electrics tripped again everything came on except the tv, once again steve came out and told us on the 3rd visit not to put the air conditioning on when cooking an absolute farce, this should have been made clear from the beginning, it was not.When we came to go back to the airport mrs wood who we had paid 100 euros to bring us and take us back to the airport came late and told us there was a change of plans steve was taking us to the airport, then she hit us with the 100 euros we had paid as a deposit ,she was charging us 50 euros for the 2 call outs and that we had been told not to put everything on so we had to pay steve 50 euros, we found out on the journey to the airport she didn't pay steve 50 euros so she must be keeping some of it , disgusting Steve was embarrassed with her charging us that much, it spoilt our holiday because my husband is disabled he spent a lot of time in the apartment so needed a tv.Before we came away we cleaned the apartment windows floors all the rubbish was taken out to the bins even the wardrobe glass was wiped and that is how we were treated.When we booked this holiday nobody told us the season was only 6 weeks long so there wasn't much for us to do, so if you want a quiet holiday this is the place for you, myself and our party wont be coming back again very disappointed. We are sorry to hear that you had some issues with your stay in the apartment . I have contacted all the individuals involved and were happy that nobody from Almlettings acted without the best intentions of the guests staying in the apartment. Firstly the mobility scooter, originally you instructed us that you were going to source this yourselves but at the last minute asked for help as your supplier let you down hence the late availability charge. Our representatives went over and above their responsibilities in organising this mobility scooter and also stopping at tourist info centre to get info for you reference trips. This is not in their remit but they wanted to ensure that your stay was as pleasant as possible. Electrical issues appear to be down to too much continuous load on the apartment circuit (ie 3 air cons, cooker, extractor fan, tv etc) which blew a circuit breaker, once this was replaced all was fine. This is the first electrical malfunction since the apartment was purchased 5 years ago. I understand that the instructions to reset the SKY were not followed resulting in many call outs to reset. Our representatives do not work for free and these unnecessary callouts by the West party after being shown initially how to reset the TV resulted in the charge being passed on. We also understand that the West party were in a hurry upon arrival and were not interested in the meet and greet instructions being given to them. It was made clear how to reset the SKY as digital lock ups are frequent in Spain, but simple to reset. Almerimar is a beautiful, quite location, this is its jewel in the crown, it is not a Benidorm type of location, the peak season is from June to the end of August but this is like most holiday destinations (school holidays etc) All this information is clearly available on the website. Also the person mentioned above is called Spencer, we do not have anyone called Steve who assists us with the apartment. Any charges for services are sorted out on a account bases usually monthly which would be the reason why Spencer was unaware. Again we are sorry that you experienced some issues with the electrics that affected the SKY TV receiver and apologise for that, these issues are regrettably unforeseen and totally out of our control. First I would like to thank Pat & Peter for ALL their help making our stay comfortable & trouble free from the moment we landed. This was our third year staying in this apartment and as usual it was spotlessly clean. The apartment has a fanatastic view over the pool with a large balcony which is great for us as we have a 12 year old that loves swimming and we can watch over him while completely relaxed. Almerimar has 2 beaches (within 5 mins walk) and many lovely restuarants and still we have not visited all of them... we have always had a fantasic holiday here and have made some life long friends. We have already booked for 2014 and have extended to 3 weeks. Thank you for endorsing the apartment and the level of service that we provide to you. Our aim as always is to try and ensure that your stay is as relaxing and stress free as possible. Many thanks for your return customer which is a true testament to the facilities on offer. Miles of blue flag beaches stretch East and West of the marina. It slopes gently into the sea. The beaches are well cared for, cleaned every day and lifeguards are on duty during the high season. There are ample fresh water showers and toilets. Many sports are available on the beaches including windsurfing, kite-surfing, hang-gliding, beach volleyball, football, pedal boats and jet skis. The beach area is also well equipped with beach bars. Almeria airport is only a 30 minute drive (40Kms / 25 miles) to the apartments. Regular flights from the UK leave from Birmingham, Cardiff, Dublin, East Midlands, Gatwick, Leeds, Luton, Manchester, & Stansted. Main airlines used are BMIbaby, Easyjet, Jet2, Monarch & Ryanair. Malaga Airport is also an option, this entails lovely scenic coastal journey of around 2 hrs taking in the breathtaking scenery and blue Mediterranean sea on the way. Go karting - There are 2 tracks available, the nearest is behind the COPO shopping complex near the E15/N340 motorway junction, the other is in Roquetas De Mar, they are 2 of the best equipped state of the art technology kart racing circuits in Europe. Here kart lovers will find professional and beginner separated tracks, training room, coffee bar, spacious changing rooms, race wears, spare part shop and much more. Shopping - There is an excellent Mercadona supermarket over from the apartment, along with banks, gift shops and medical facilities. Up near the E15/N340 motorway junction is the COPO Commercial Centre which is a very large shopping complex, housing amongst other things, McDonalds, multi screen cinema, tourist information centre and the Go Kart circuit mentioned earlier. Just across the road from the COPO centre is a new modern hospital. Markets - there are many markets around the Almerimar area, these have a good selection of clothes, leather goods, footwear, food, ceramics and pictures. Most of these start at 1000 & finish around 1400, they are open every week except for the last Sunday, Wednesday and Thursday of each month. Water park - Mario Park at Roquetas De Mar is a great day out for the whole family, open from 1100 to 1900. Oasys (Mini Hollywood) - At the nearby Tabernas desert you can visit the mini Hollywood which was used as the location for the filming of many spaghetti western movies, A Fistful of Dollars being one. Many of the film sets have been preserved & are open to visitors. Booking Notes: €200 deposit is required to secure the booking, with full payment required 4 weeks before your intended stay dates. Also upon arrival a €100 breakages deposit needs to be handed over, upon departure if no breakages this is returned.